All art feels a deep connection with the self. It is not simply a skill or an art form, but the experience of one's being. The heights one travels within, the life of a movement, it's vital breath, the pulse of life. Is this vitality of being Art? A recognition of the raging elephant with the lotus in his trunk. 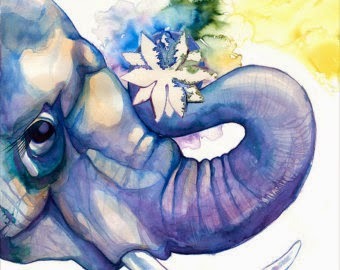 The soul feels like a mad elephant within the body's cage, lusts to life outside, yet more aware of it's being. Sometimes an artiste loses touch with this being within. The elephant's sounds are drowned in the drone of daily life. In a second of release, a life-altering moment, the elephant escapes and tramples all the vegetation around. "I look at its sheer size and force and wonder, how come I never saw it before? Yet now I remember, the faint sounds I heard and ignored, the vibrations within, that I turned into movements in dance. This mad elephant rages now and takes over the world, my being, within and without. I see it's skin, tusks, trunks and feet, it's beautiful grey and rough skin, how warm and real it feels. So beautiful, he reminds me of the elephant who was a devotee of Vishnu, possessed yet serene. The elephant is me, the life of my life, the stirrings within. The discovery of myself. Why am I an artiste? Because I guess I am. I exist. I pulsate with the universe to dissolve like the waxing, waning moon. The mad elephant has seen its reflection, it's insane with joy, it was waiting for that point of release. Within one moment, it found itself forever and ever."